A small group of Dartmouth alumni set off on foot from the Moosilauke Ravine Lodge early on June 9. Their quest to reach the peak of Mount Moosilauke that morning was met with icy rain, near-freezing temperatures, and 50 mph winds. But the members of this hearty group – all septuagenarians – weren’t letting a little spring chill get in their way. After all, they have long had the Hill Winds in their veins. 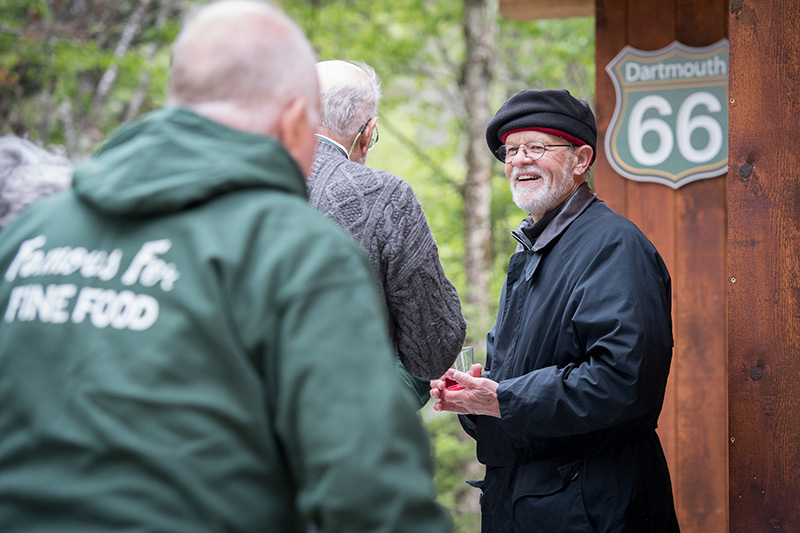 The hike was organized by the Class of 1966 to honor its outdoor heritage and celebrate its 50th Dartmouth Reunion. As the hikers made their way back down the mountain, preparations were underway for the evening’s dedication of the new Class of 1966 Bunkhouse. The class raised $519,000 from 162 donors to build the four-bedroom family-oriented bunkhouse, and members gave generously of their time as well. Over the nearly 12 months of building, class volunteers worked 4,000 hours to see the project through completion. David Hooke ’84 guided volunteers during the construction process. His business, TimberHomes, specializes in community-powered timber framing projects, which allow people to cut, assemble, and raise the frame of the space their community will eventually occupy. Following the dedication, classmates and their families retreated to the new bunkhouse to admire the work and gather around the roaring wood stove. The blustery wind that drove them inside was a reminder of why the class chose to construct a winterized bunkhouse. As anyone who has spent time in New Hampshire knows, weather during the shoulder seasons is hard to predict, but the desire to play outdoors never wanes. The Dartmouth Outing Club hopes to run future snowshoe and ski excursions from the property. 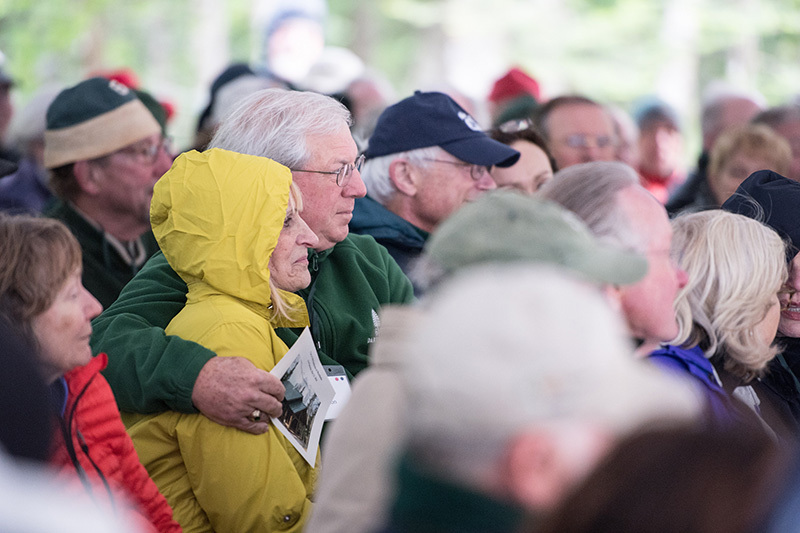 The Class of 1966 has been instrumental in connecting students and alumni to the outdoors and to one another. Moosilauke Ravine Lodge, originally constructed in 1938, is slated to be rebuilt in the coming year. Battle and his children, Daniel ’01 and Emily ’05, have made a $5 million challenge gift to support the rebuilding efforts for future generations of Dartmouth students. 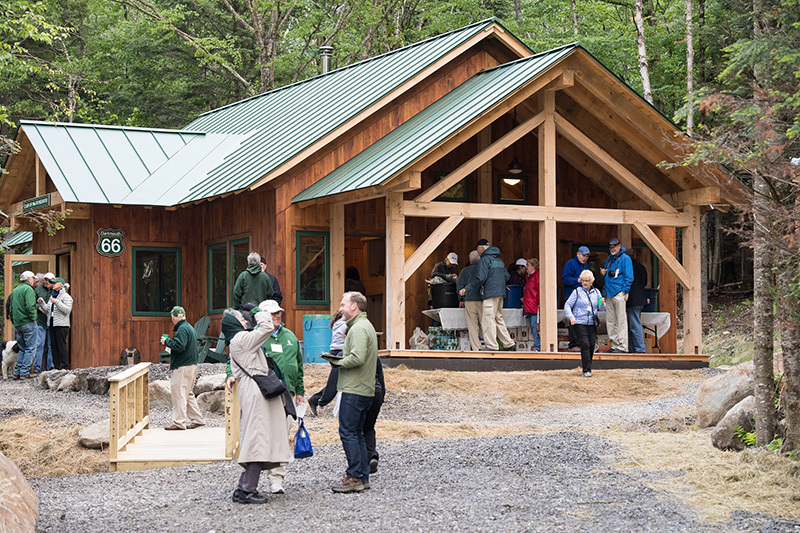 View additional photos from the Class of 1966 Bunkhouse dedication.